The Sinclair C5, the answer to global warming rejected by the masses . . .
Electric vehicles are nothing new. In fact, the first ones have been invented many decades ago, and could now be the norm on our roads if everyone had been working with that idea in mind. Of course, any established industry fights to keep itself in place, and the automotive industry is quite large. The electric car was more or less exterminated until very recently, when traditional auto makers realized they could no longer push back the future and started introducing the hybrid vehicles we know today. But not everyone bows down to the desires of the wealthy, and one particular company that kept working on electric vehicle is Sinclair Research. 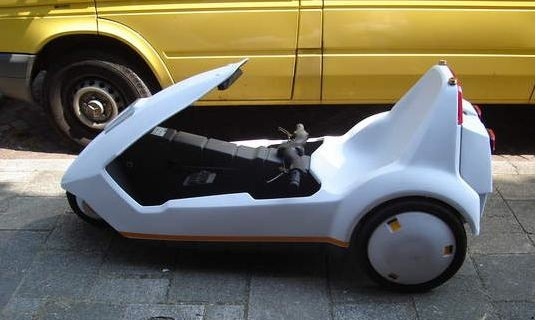 Back in 1985, Sinclair introduced the C5, a very unusual electric vehicle meant for the UK. It’s not really a car, more like a tricycle with three tires, and the motor could only assist the driver, not do all the work. Someone would need to pedal in order to recharge the rather small battery, which could then power the electric motor that could bring you up slopes and so on. The vehicle was also very low cost, which was surprising, since back then electric bikes or vehicles of any type working on an electric motor were very rare. It proved to be very popular in the media, but unfortunately for the company, it wasn’t a good seller. The main issue was the fact that it was an open tricycle. In the UK weather, any type of vehicle without a roof would cause a problem. It also had design problems. The cold weather drained the battery much faster than anticipated, and the low profile meant that the vehicle could be hard to see on the road, causing fears of accidents. In all, 17,000 units were sold during that year. They eventually made a racing model of the C5 which could go up to 150 miles per hour, a new record for an electric vehicle, but those did not sell well either. Sinclair didn’t give up however, and just recently the company announced their X-1 vehicle. The design is actually heavily inspired by the C5, but with a much better finish and better technology as well. For one thing, the X-1 has a roof, making it easy to ride when it rains or in mild cold. It uses a 24v Lithium battery pack and again can be used in conjunction with the pedals inside of the vehicle. The company said of their earlier C5 model that it was a good attempt for the time, but now technology has improved greatly and the X-1 will be a next generation electric tricycle. The design was introduced in 2010 and set to be released in 2011 in the UK, but delays have been pushing this release back. If it ever hits the road, the price should be around 595 pounds. That was the answer to global warming right there, but economies take first consideration over the environment as usual. I’d love an X-1, although some places I wouldn’t like to drive around in fear of getting ‘car’ jacked or, C5 jacked. A pretty good lock would be needed as a weightlifting thief would just pick it up and take it away. In other remote places where people are not familiar with new technologies, such as Cornwall in England for example, it may frighten them at first.